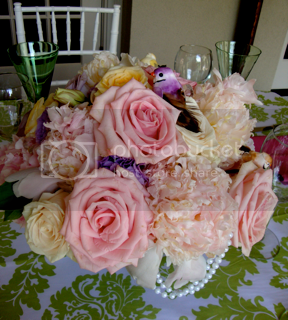 Dana Markos Events; Event Design and Floral Styling: Bridal Showers bring...MARIE ANTOINETTE! If you're a bride-to-be, there's no doubt you've seen lots of really great showers. 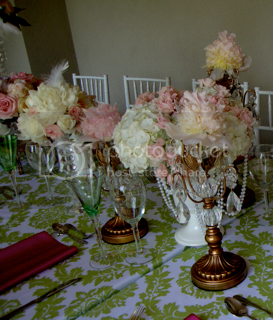 There are so many ideas to choose from, so when one of my brides, Maggie, asked me to create a "Marie Antoinette" theme, I was ecstatic! 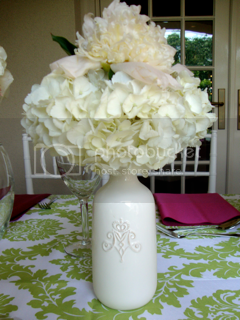 The great thing about bridal showers is that the possibilities are endless! It's a time to be creative, fun, and really explore the unexpected! 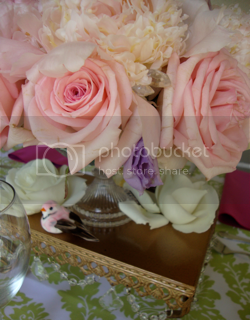 Bridal showers enable the bride-to-be to interact with her family and close friends; so we had to make it special! 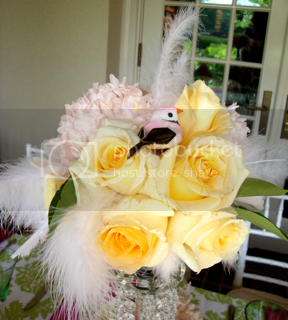 We had a lot of fun with this theme, and the bride sure enjoyed it too! 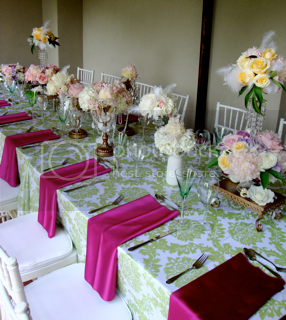 We used a green and white paisley linen for the table and fuchsia napkins for the place settings. 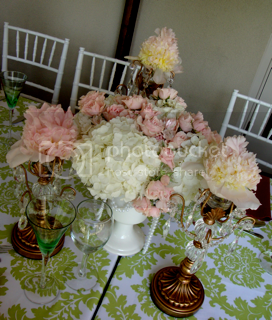 It really brought the table to life and matched the elements of the time period. Kudos on the color choices mother of the bride! and jewels. 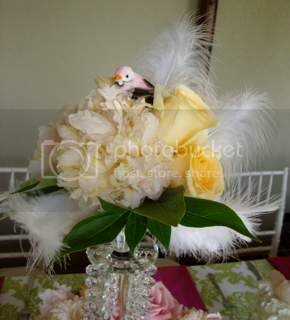 Since they were all representative of Marie Antoinette, we just had to incorporate it into the floral arrangements! 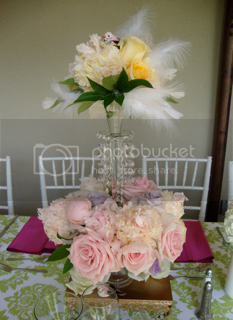 To hold the arrangements, we used gold trays with crystal compotes to create a three-tiered look. 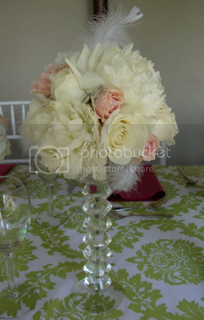 We couldn't complete the table without some beautiful flowers. 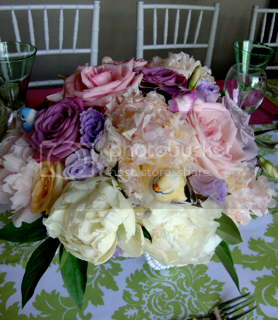 The floral arrangements included roses, hydrangea, peonies, spray roses, and lisianthus. while French-country, porcelin jugs held others. 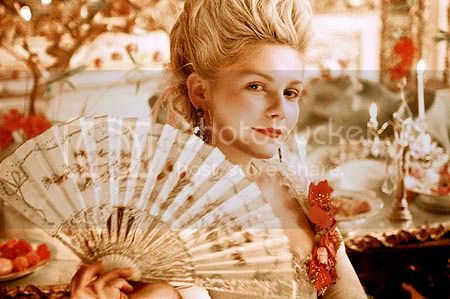 Overall the shower screamed Marie Antoinette! It was a complete success and we had so much fun doing it! We were so happy to see Maggie and her guests having a great time, and that's what it is all about. There's nothing like having a little fun in style. i absolutely love it! What an eye for detail you have! Wow those are some great photos! I love the flowers! Beautiful photos - thanks for sharing! 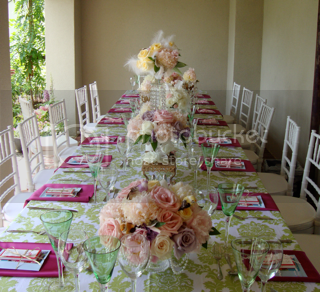 You really captured the Marie Antionette feeling of opulence and romance! Dana - you did such a wonderful job! I loved it and love seeing the pictures! Looking forward to working with you for the wedding! How to Have a Simply. Perfect. Wedding. Mazel Tov Emily and Jason!